Chris Hadfield just wants to have fun. 10 Mar Chris Hadfield just wants to have fun. So, this happened… Guess which one is the astronaut? I’m in Banff this week hosting and moderating a four-day conference for entrepreneurs. The group is Entrepreneurs Organization (of which I’m a member, by the way) and 250 entrepreneurs from around the world are here to learn from each other and from global experts. 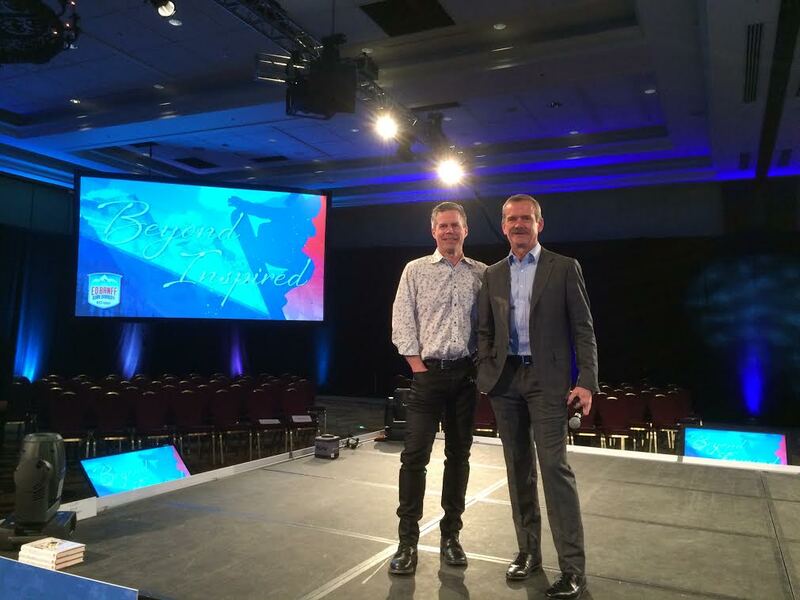 Today, I got to share the stage with Chris Hadfield. Ok, that might be a slight exaggeration. The truth is I introduced him, and then he spoke, and then I asked him some questions. But “shared the stage” just sounds better, doesn’t it? He was inspiring and smart, and clearly a guy who is very focused and thoughtful about what he wants his life to look like. He spoke of the Space Station mission. It was a five-year project, ending with months in space. He was the commander. He sat down with his team of six people at the very beginning of the mission and asked that question: “What would perfect look like in five years?” They talked it through and came up with this list, with my comments in italics. I really liked that list, because it had some big goals, and the first two involved a lot of focus and work every day. But the third one was surprising and powerful for me. Because my tendency is to think that the bigger the goal, the bigger the suffering. No pain, no gain, right? But he was very clear that although his goals have always been big (“I want to walk on the moon”) his victory bar is very low. He is very big on finding joy in the process. “I try to win the day by 9 a.m.,” he said. He tries to find reasons to feel great about the day as soon as he wakes up. He has no time or interest in suffering for suffering’s sake. That was an impressive learn. But my story from his sound check was even more so. He came in for a sound check before he was on stage. Every guest we’ve had has done the same thing. When they come in, the place is empty except for the tech crew, the organizers and me. The speaker will come on stage, I’ll talk through their introduction, we’ll go over some questions that I will ask them. Then they’ll flip through their Power Point presentation or play videos if they have them, and test out the microphone. That’s exactly what Chris Hadfield did. He flipped through his pictures on the screen, then said, “Can you turn this up really loud? I’m going to play a video of the rocket takeoff. I need this to be the loudest thing these people have ever heard.” The sound guy cranked it and the place shook – me, the tech guys, and 250 empty chairs shaking. Then I asked about his introduction. “Do you want me to introduce you or do you want the video intro?” We settled on the video intro. Then he asked, “What’s the lighting going to look like for the Q and A section?” The lighting guy showed him. Then the sound guy asked, “Would you rather a lapel mic or a hand held mic?” He wanted a hand held. “What’s that?” asked Chris Hadfield. And without missing a beat, Colonel Chris Hadfield, the most decorated astronaut in Canadian history, said, “Good question, because it’s a rough landing,” and went on to explain to Liam, the rest of the tech guys and me, how he got back to earth after his last trip to space. You could hear a pin drop. And not just because the place was empty. But because he was such a decent guy, a man so proud of what he had been able to do for himself, for his country and our planet, that he took the time to explain to Liam in an empty auditorium how he got down from space.